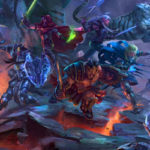 Home » News » Announcements » Sword & Sorcery on Kickstarter: 290% funded in the first day! Sword & Sorcery on Kickstarter: 290% funded in the first day! The Sword and Sorcery campaign on Kickstarter had a great start! After achieving the initial funding goal of $75,000 in only 90 minutes, the crowdfunding project ends its first day with over $215,000 pledged, more than 2,200 backers and ten stretch goals unlocked (seven funding goals and three social goals). The stretch goals reached in the first 24 hours unlocked new contents to be added to the Sword and Sorcery Kickstarter Edition: Sally the Wolf (Companion figure), Death Knight Undead Enemy (a set with five new figures and cards), Treasure Cards (20 additional cards), Orc King (one figure and Master Enemy card), Skeld Berserker/Slayer (one hero figure, hero sheet, soul gem and 15 cards), 20 additional Adventure Cards, Cursed Crypts (5 new double-sided map tiles). Social achievements unlocked an useful Player Aid sheet to help players on getting a quick start on their adventuring career, Blessings cards, and Enemy cards, allowing a crossover with Galaxy Defenders. 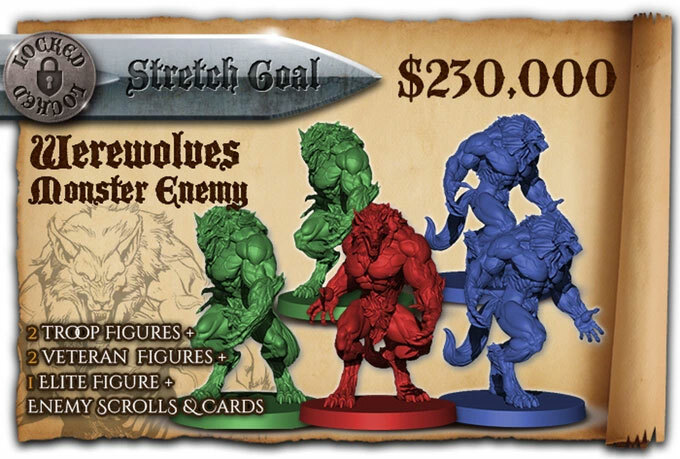 Werewolves, to be unlocked at $230,000 pledged. The campaign is near to reach the next Stretch Goal ($230,000), which will add to the rewards the Werewolves Monster Enemy, a new set of figures, enemy scroll and cards. Other two goals were already announced, at $245,000, the Act II Darkness Fall (additional quests), and $270,000, for the Lycanthrope hero's curse (figure and curse card). 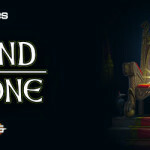 The Sword and Sorcery campaign will run until November 13th, at 3 am CEST (1 am UTC/GMT). For more information and to pledge, visit the Sword and Sorcery Epic Fantasy Co-op board & miniature game page on Kickstarter.